DUSHANBE, Oct. 12, Chinese Premier Li Keqiang on Friday lauded the China-Russia bilateral relationship, which has kept high-level development momentum and made remarkable achievements in economic cooperation. Li made the remarks when meeting with his Russian counterpart Dmitry Medvedev on the sidelines of the 17th meeting of the Council of Heads of Government of the Shanghai Cooperation Organization held here. The Chinese side is willing to strengthen comprehensive strategic coordination with Russia, Li said when speaking of the successful meeting of the two countries' leaders at the fourth Eastern Economic Forum (EEF) held in September in Russia's Far East city of Vladivostok. New impetus can be injected into bilateral cooperation by expanding cooperation fields and converging interests of both countries, Li said. Under the current complex and changing international situation, China is willing to innovate cooperation ideas together with Russia to further explore potential, Li said. He added that cooperation in energy, finance, as well as science and technology, should be boosted to enhance bilateral high-quality cooperation. 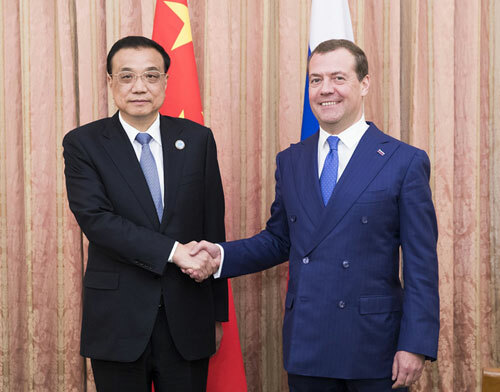 For his part, Medvedev said with steady and practical cooperation in all fields, positive development of energy cooperation and deepened regional exchanges, the bilateral trade is expected to exceed 100 billion U.S. dollars this year. Russia is willing to work with China to safeguard multilateralism and free trade, contributing to the world peace, stability and prosperity, said Medvedev. He also said that he expects to visit China this year for the China-Russia Prime Ministers' Regular Meeting.